Imagine you're walking down the street when you hear a ferocious growl and the sound of a large animal thundering toward you from between two houses. Your heart practically explodes from fear as you turn around to see a huge dog leaping at your throat. Quick, how will you escape? Easy, just quit imagining that! But . . . how will you escape the low-paying rat race and finally get the good things in life that you want and deserve? Quit imagining what it would be like and start doing something about it! Imagine a job where you have no boss to kiss up to and no office politics. Imagine a job where you set your own hours and work the days you choose. Imagine a work environment as relaxed and comfortable as your own home. Imagine a job where you can boost your own pay several times each year. Imagine a job where you make money even when you're not working! Imagine a job you enjoy so much you're happy and excited to begin each day! It's not, it's very possible. I know because my job is like that. I work for myself from my home office and it's been my only job since 1999. You probably don't care about that, but you'll care about this—I can teach you how to create your own dream job too, just like I have. This isn't just another get-rich-quick scheme that doesn't work. This is about becoming your own boss one step at a time, with very little risk, exactly as I have done. I started this web site in 1997 and spent two years building my income streams up to the point where I could leave the rat race behind and just work for myself. It may take you more time, or less time, depending on you and your desire level. That's one of the nice things about it, you can work at your own pace. Good! In the last few years we've bought two brand new cars, had a $7,000 ceramic tile floor installed, spent over $11,000 on other remodeling, bought all new kitchen appliances, a 52" big screen high-definition TV, new living room furniture, three new computers . . . need I go on? I didn't say that to brag, the point I want to make is this: we wrote a check for all that. Making payments is a poverty trap that will keep you down financially. Payments are part of the rat race. Thanks to selling information products, the only thing we owe is a very small mortgage, and we have lots of nice things and live in an above average home (one of our neighbors is a doctor to give you an idea of the kind of neighborhood we live in). A brand new car of your choice. A state of the art home theater. A whole roomful of new furniture. Or how about a new boat, dazzling jewelry, a camper, a motorcycle, a whole closet full of new clothing, or finally being able to remodel your home. ...and just writing a check for it and still have plenty of money in bank! How about taking a dream vacation . . . every year! Or buying that dream home or vacation property you've been wishing you could afford. All these things are possible—it won't happen overnight, but is what you're doing now going to get you that kind of lifestyle? You need to ask yourself two questions. Do you really want to become financially independent? Do you really want the kind of life you have so far only lived out in your mind? If you answered yes to both, it's time to stop dreaming and start doing. Or, as I stated earlier, it's time to stop imagining the good life and take steps to make it happen. One of my favorite sayings is, "If you do what you've always done, you'll get what you've always gotten." That makes a lot of sense. One thing that doesn't make sense is how so many men and women will do the same thing over and over, yet hope for different results. Life just doesn't work that way. If you walk down the same path every day you end up at the same place each time. That's not how to build your dreams-come-true. That's how you get stuck in a rut and watch your dreams slowly slip away. The simple truth is, few people ever gain real financial independence and a high job satisfaction while working for someone else. This is more true today in a global economy than ever before. Do you work for someone else? If so, are you wealthy? Are you truly excited to go to work each day? You work for yourself, set your own hours, and take days off when you want. You earn good money, even when you're not working. Your work is exciting and rewarding—both financially and personally. They have a high perceived value and high profit margin. They are easy to deliver and there's no product to stock. They offer instant gratification to customers. They can be sold and delivered over and over for pennies. They can take as little as a few hours to develop. You can start in your spare time. There's very, very little risk involved. Even if you never come up with one idea that explodes your income, it's well within reach for you to create additional income streams that will greatly enhance your lifestyle. Plus, there is always the chance that you could hit the jackpot. It does only take one product to hit it big. How to generate ebook ideas. The essential ingredients of success. How to create compelling titles that sell. Where the software is and how to use it (including FREE software). How to create a site for your ebook, optimized for search engines. Where to list your ebook. Where to get it reviewed. How to take credit card payments without a merchant account. How to have others sell it for you on commission. ...and much more - just look at the Table of Contents. It's got it all, and if you act now I'll give you two great bonuses. You need a way to make your information into an ebook, and with eWriter Pro you can easily make PDF documents. PDF documents can be read by both Windows users and Mac users, so you'll have a bigger audience than if you just make Windows ebooks . . . but, I also show you how to make Windows ebooks inside eBook Farming in case you want to make both types of files. Not only that, but you even get the resale rights to eWriter Pro. Resale rights means you can sell this software yourself and keep all the money you make from it. I sell eWriter Pro on this page. Scientific Advertising, the classic book by Claude C. Hopkins, is considered by many to be the best primer on advertising available, and has been called 'bible' of advertising. Originally published in 1923, it's timeless principles are as relevant today as they ever were. The book may be out of print, but this PDF version will help you in your quest. I include giveaway rights with this, so you can use it as a bonus item for your first ebook. eBook Farming—learn how to make money online. eWriter Pro PDF Maker with resale rights. Scientific Advertising with giveaway rights. ...all for the low, low price of just $27.00! Frankly, for a product that teaches you exactly how to make money selling information products and includes two very appropriate bonus items, that's a very low price for such an excellent package. If you want more than you have been getting, you have to do something different or you'll just get more of the same. Be bold and break the mold, or keep getting the same old, same old! I originally wrote eBook Farming in answer to a question I kept getting from my newsletter subscribers, "How can I make money online," they'd ask. I wanted to come up with something most people could do. Knowing each person had different skill sets and backgrounds, with many on a limited budget, it had to be something that most people already had the skills to do, or could learn if they were willing, and wouldn't cost too much to get started. Easy enough for most to learn. Could be duplicated by a variety of people if they have the desire. Many of my newsletter subscribers have become good friends. Even if I haven't yet met most of them in person, we have exchanged dozens and dozens of emails and we chat on ICQ. I have spoken with some on the phone, and even met a few in person. I wrote eBook Farming like I was writing it for a friend, because in my mind, I was. That's the story behind eBook Farming. I thought it might help you decide if it's right for you or not. You can read a text excerpt from the chapters in blue text. You must allow pop-up windows to read them. 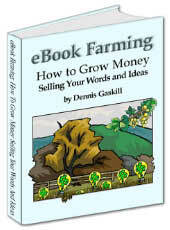 Your eBook Farming is the only comprehensive tutorial on this media I've read. Your grasp of what it takes to create a successful ebook is amazing. Your chapter on your success philosophy is awe inspiring. I can't tell you how good it is because it's THAT good! Thank you for sharing all you know! I love it! eBook Farming is a terrific value. With this information, you can launch a successful writing career, even if you're broke. There's nothing else like it. A comprehensive step-by-step guide on making money with your own words. It's finally here, farming that pays! Thank you Dennis. I have been a fan for some time now, and for the first time in my life, I want to thank somebody for parting me from my spondoolies (money). If every thing in the world was as sincere as this publication there would be no wars, plus and PLUS what a wonderful world this would be. I am proud to be associated with you and what you are trying successfully to achieve. After the first reading, the motivation is there already. I have a lot to learn, but I know I will get there now. THANK YOU! Dennis has a way of painting a very complete picture - regardless of the subject matter. His writing is so clear and easy to understand, that the whole process of writing, publishing and making money with eBooks seems deceptively simple! That's because he walks you through all the necessary steps, providing samples, encouragement and outstanding resources!! Regardless of whether it's his web site, his software, or his tutorials, you can always count on the quality being first rate. 'eBook Farming' is another great example of how well he walks his talk! I had already been thinking about it, but your book has definately motivated me. Well done! I have read 50% of the eBook over the weekend and I am awestruck. It's exactly what I would have expected from you, bloody brilliant! A lot of online ebooks are full of fluff and not worth the digital space they take up, but that's definitely not the case here. I actually printed out the book so I could thoroughly absorb its content at my leisure. Information products are hot sellers online and marketing your own product in the form of an ebook is a great way to control your own destiny and the amount of money you can earn on the web. If you've been thinking of writing your own ebook, I highly recommend you purchase this one as a reference guide. Dennis also fancies himself a bit of a philosopher and the final chapter of the book is like a mini course in motivation. He calls this his "success philosophy." He's actually very good at giving this advice. If you subscribe to his ezine, which I highly recommend, he shares many of these philosophical gems in each publication. There are so many products out there and just writing an ebook of your own is not going to guarantee your success. You need to get the word out to make the sales! This book takes all the work out of it by pointing you to the best sites online to market and promote your new ebook. Imagine having all of the hard work done for you; now all you need to do is write your book. So what are you waiting for? Get your copy!